I’m unsure as to why people think this is a poor copy of the ams 21 as it looks almost identical imo. 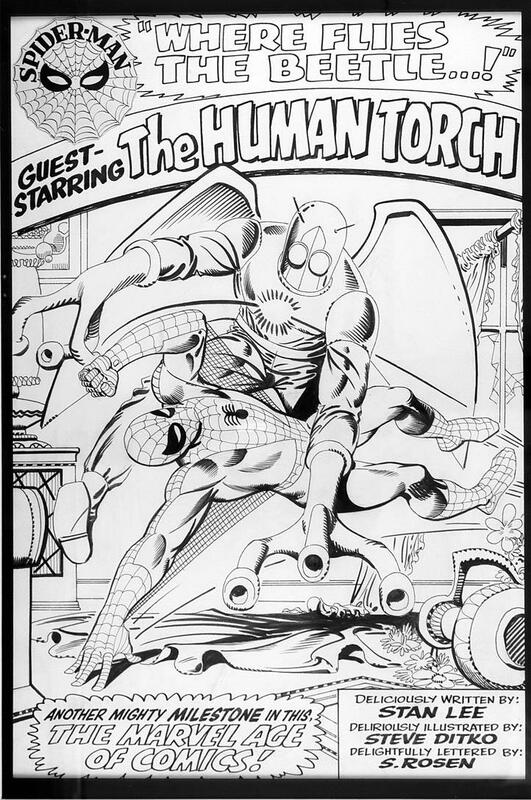 Here's Ditko's original splash page artwork. Would suggest you take the time to carefully study this and compare your re-do against it. If this piece were propped up on a park bench and I saw it while driving by at 70 mph I'd probably think the same thing. Take a close look at the feet, the hands, the eyes, the proportions, the lines, the symmetry or lack therof. Once you see the discrepancies you won't be able to unsee them. My first reaction upon seeing Zanga's drawing in his opening post was, "God, that looks awful". Then I looked at it in detail and concluded, "God, that IS awful." Id like to point out that I’ve not bought this to sell on, just to have a unique piece of marvel art from the guys from the time and if this isn’t it then it annoys me greatly. It's definitely not "a unique piece of marvel art from the guys from the time". Sorry. I found it very strange that the whiteout is there. Interestingly there is a bit of whiteout above the beetles head and in between Spider-Man’s legs too. It could just be to mask a smudge or even the beginning of a dedication. I appreciate your comment in playing devils advocate with regards to its authenticity age-wise. This piece has always bugged me that the previous owner couldn’t give me a 100% record of its origin as it was sold to me via an art gallery and perhaps foolishly I’ve assumed it to be of genuine worth. Thank you all for your input, it’s given me food for thought. I'm not nearly as educated as a lot of other people here, but one way you can distinguish some fakes (at least the mediocre ones) from originals is there is hesitancy in the artist's work. Take a look at the wings' inked outline, for example. Notice how it isn't cleanly drawn? Compare it to the pro's job on the original. Another clue is to look at proportionality of objects which are supposed to show perspective. For example, look at Spider-man's right calf. It isn't right; the problem is a bad attempt at drawing depth into the object. That should also lead you to notice how the feet don't make proportionate sense, either. A good fake only gives out a few clues, this has others, but that should be enough. Now some artists do deliberate "squiggly line" work, like Talaoc, but there, you can see that even the squiggly stuff follows a pattern. This one mixes squiggly with straight line (like in the Spider-man image). That's another giveaway--a pro won't do that. I'm not sure how many things you have bought, but this is a dangerous hobby if you being asked to spend a lot of money. Let me suggest you go to some shows and just spend time looking through the books for the sake of learning. Then pick some artists you really like and look at a lot of their stuff. Only then, take a gamble. I saw Neal Adams sign a sneaker for $10. On reflection, I fear I've been a bit too brutal in my posts on this subject and I apologize to Zanga if I've come across as too heavy-handed in my rebuttals. All I was trying to impress upon him is that this artwork is not what he believed it to be and that looking for a refund would be the way to go. The Voord shows so much class here. Zanga this was a case of tough love.I also feel that you might be better off returning the art. It's not what you believed it to be. I truly want you to gain a measure of satisfaction so you do not sour on this neat hobby. Again if you like the art and are satisfied that's all that matters. All the best!!!!! He must have signed 2 of them. ha ha. I love Neal. I was at SDCC many many years ago and a buddy of mine was contemplating a commission from Neal and the price was $600.I think my buddy took to long to decide and a grumpy Neal snapped, " You wanna go online and see what people are selling my art for?" It was so awkward. We love Neal though and it shows the precarious relationship we have with the artists sometimes. Even today "fans" request a sketch or autograph for free than throw it up on ebay to profit. This is the kind of stuff Neal was lecturing us about at the Con. I can see that frustration but there must also be this concession. As fans our mad desire to possess original art has driven prices toward Mars. So Neal I'll pay $20 per Croc if you'll draw me a small Batman head sketch with Sharpie on the heel. Saying it looks almost identical to you means you are a novice at artwork and there's nothing wrong with that. An expert on fishing lures would see a million things in some valuable fishing lure that I could not see. But believe me-they are no where near identical the only way it could be worse is if it was a stick figure drawing. Hopefully, a side-by-side comparison might work better for Zanga to judge the differences and I'd be interested in hearing his feedback as to whether or not. 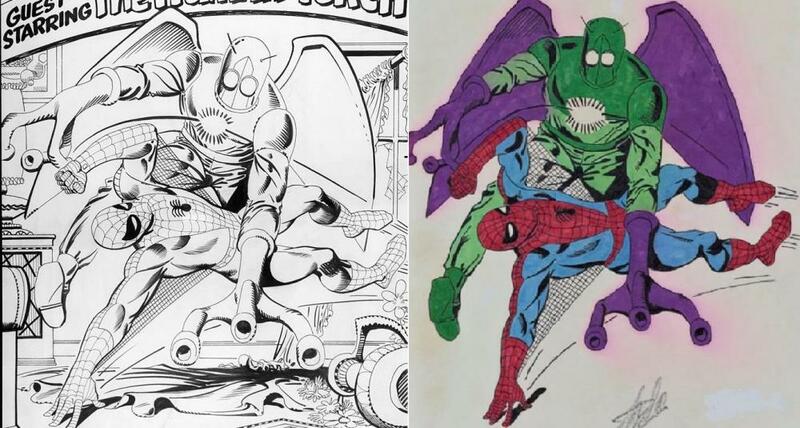 he still considers his art to be almost identical to Ditko's original? I’ve been quiet for a spell as this thread has given me much food for thought. It pains me to say it but this piece did cost me a lot. And as some of the comments allude I was led to believe it was an original. Not nice to have something that you doubt on a wall. I was very excited to have an original piece from one of the greats that shaped my childhood. Not sure what to do with this going forward because unless I open the frame I can’t check under the whiteout. Again thank you all for teaching me more about this subject and your valuable insights on this piece. Better to know than not know eh? It pains me to say it but this piece did cost me a lot. You should ask for a refund and return the 'artwork' to the seller. No doubt in my mind whatsoever that it's a fake. He is right. If it was a gallery especially. The amount of time that has passed should not matter. Well, you still don’t have a piece of Marvel art, but rather a fan drawing of a Marvel character. This was never printed, nor is it even an unpublished drawing. Some fanboy, at some point in time, sat down and did this terrible drawing. Someone threw it under Stan’s nose to sign. What “reputable art gallery” did you purchase this from? Value = what ever the overpriced signature cost. You should get a refund as you have been duped. Yeah I’m going to enquire as to whether I can return it. I fully am aware that stan’s signature is brand new. Which is fine. But the heft of the price is on the fact that it’s an original piece of art. Which I’ve always doubted.